Home » Forum » Contractor Talk Community » Off Topic (Non Trade) » Any Of You Cook? Re: Any Of You Cook? Can't do the damn pics, and while a 9 on taste was a 2 on presentation anyhow. Wife sends me out to go get some meat for dinner. No worries, couple bone in Ribeyes and tomahawk pork chops for the two of us. It was a celebration in order of me eating veggies again (still no breads but hasn't bothered me at all). And man is it wonderful. Ate it all for lunch again today... Life is good. Has your diet gotten rid of the cramps, diarrhea, bloating and the back-ache? Stomach is a lot better, back not so much... Thanks for asking. Food was good on Saturday though. Doing a bunch of smoking while in the shop this weekend I think. Doing a bunch of smoking while in the shop this weekend I think. I smoke in the shop too. It’s one of the few places I’m allowed to. I've taken over my back patio my wife isn't allowed to complain back here. Ohhhhh. I get it now. Never mind. It's funny because I don't smoke anything, (sometimes but rarely a cigar) but like the smell of a burning cigarette. Doesn't bother me at all and my wife finds it repulsive. The after smell I'm not too keen on though. Anyone ever smoke a whole tenderloin? I thought of smoking it low and slow and then hitting it with a reverse sear. Thoughts? It sounds tempting but, I'd stick with done rare on the grill. Just not enough fat on tenderloin imo to smoke it. I've smoked pork tenderloins with good results. Only ciok them for about 3 hours though, not 10-12 like a brisket. Neighbor lady brought us dinner tonight for taking care of her animals for a few days while they were out of town. 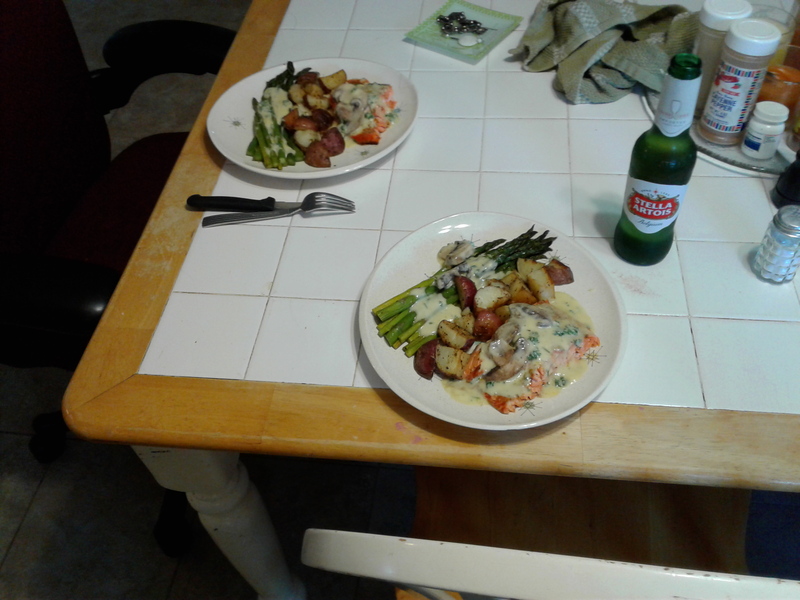 Sockeye salmon, red potatoes & asparagus with mushroom sauce. Threw in a 12 pak of my favorite beer too. I never expected payment of any sort but, hard to turn down good eats. I have been blessed with good neighbors. It's ok. Order one in Belgium and you will look like a tourist...over there it's a mediocre peasant beer.